SPOTTED: Reclusive Fanfin Angler and her latest beau step out for a romantic lure-lit dinner. Then again, Fanfin Anglers never appear pleased. That's just the nature of their face. 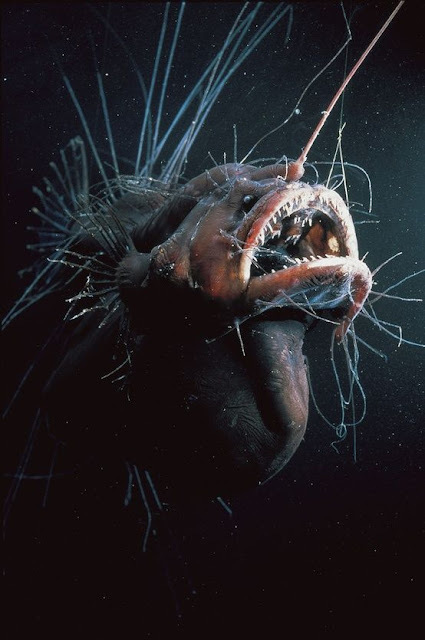 These Deep Sea Anglerfish reside in depths of up to 1,500 metres (4,950 ft). Their tiny eyes are almost useless for spotting prey and their near spherical, 20 cm (8 in) long body is hardly built for a merry chase. But that toothy, scowling maw must be fed! 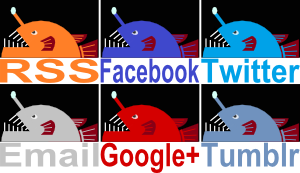 Good thing the Fanfin Angler lets her prey do the work for her. Like other Anglers, the Fanfin's snout boasts a dastardly lure that attracts inquisitive fish and crustaceans. For shallow water Anglers like the Monkfish and the Frogfish, this lure might look like a worm or shrimp. In the darkness of the deep sea, it hardly matters what it looks like so long as it lights up. The Fanfin takes it to the next level with her truly fabulous fan-fins. Sure, she has some normal fins for swimming around, but they're completely overshadowed by the ones that have turned into a burst of wiry fin rays. Together with various filaments that grow from her skin like whiskers, they allow the Fanfin to feel creatures as they come within lunging distance. She's a glow-in-the-dark ambush predator! In this amazing video, it looks as if her fin rays are themselves glowing. It's not clear if that's due to bioluminescence or if they're reflecting light from the submersible but either way she looks like a sparkling firework! 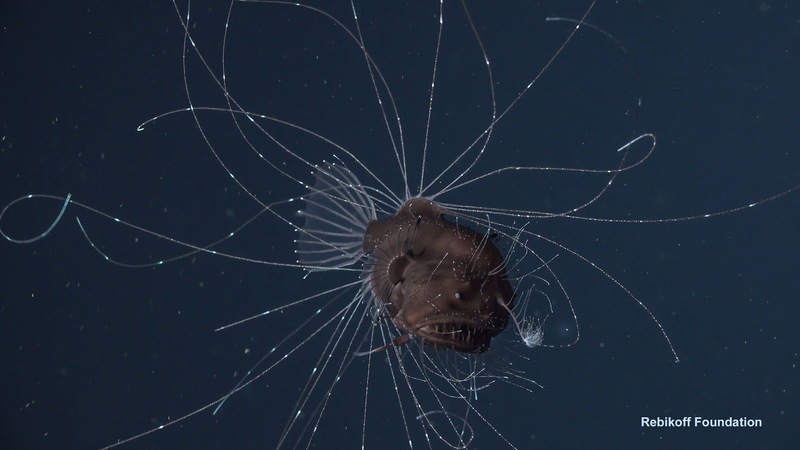 I never thought I would ever say that about a Deep Sea Anglerfish. Deep Sea Anglerfish are famous for their intimate, long-term romantic relationships. While females have the lure and the teeth, males have the big nose. He uses it to sniff out a female and when he finds one, he lovingly nibbles at her side and slowly fuses with her body. He dangles there, her blood flowing through his veins. He's not too much of a burden, given that he's less than tenth her size, and he also provides sperm on demand. He is, essentially, her very own testicle. And now we get to see it on camera at last! Wow! Fantastic! The most beautiful, and the ugliest, at the same time! Don´t know what to say about the male-female relationship...But who could ever resist a lure-lit dinner in the deep sea??? an ugly firework, that's a new one. The fan-fin angler looks like an angler fish and a tentacle monster (or a jellyfish, whichever you prefer) had a baby, and the baby took more after mama angler. @Maria Thulin: I always wondered who would win in a fight, the most beautiful or the ugliest. I think the ugliest won this round! @Porakiya Draekojin: Most fireworks happen in the sky at night. Who knows what's hiding in there?